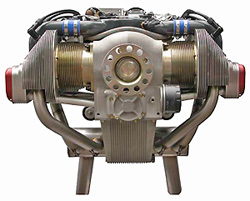 ULPower engines, represented in North America by UL Power North America LLC, have been developed specifically for use in light aircraft and are manufactured to the highest standards with fully electronic ignition and multi-point fuel injection (FADEC) system as standard equipment, with several lightweight models ranging in power from 97 - 130 hp, making them an excellent choice to power the two-seat Zenith kit aircraft models. Contact Zenith Aircraft Company directly for the latest pricing and availability information. Currently, the complete firewall forward package is available from Zenith Aircraft Co. for the UL350iS engine installation in the CH 650, to be followed shortly by the STOL CH 750 (as the two aircraft models share the same firewall). Since the UL Power engine is imported from Europe engine prices fluctuate on a regular basis due to currency exchange. NOTE: All above information is subject to change and revision without prior notice. Source: UL Power. The above resources are provided for informational purposes only. Price information, availability and equipment subject to change without prior notice. Alternative engines will affect performance, specifications and flight characteristics of the aircraft. Also, the weight and balance of the aircraft may be adversely affected by alternative engines, and the original fuel system may not be adequate or suitable for some engines. Most alternative engines will require a custom engine mount and engine cowl. Zenith Aircraft Company does not manufacture or directly support engines installed in kit aircraft.